is that the drawing on it isn't that great either. Sigh another terrible card. Well as you can see by my high rating i truely adore this card. Hehe yahh right, Well when it comes to writing and you should always be true and im saying this card is not worth my time doing this COTD, it shouldnt even get the title "Card Of the minute". I dont even think i have any pros right now for this thing, and if i do i doubt it would even be called a pro maybe a slightly not rude con but thats about it. Well let me get down to the point of this card. 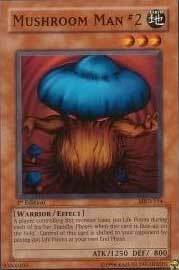 If you really want to have a crazy hippy deck, and inflict damage to your opponents lp directly then i suggest putting this in a back up to your first side deck (thats just how good it is :/). In closing, who picked this card? and why? Trunks the Swordsman No review. Pot of Greed No review.